Tracie Cheng's paintings call to mind natural phenomena with a playful and dynamic quality of space and movement. Interested in patterns, forms, and fractals in nature, and how they densely overlap in the world around us, Tracie creates ethereal spaces that refashion our typical perspectives. There is a richness in the fluid layers and interweaving of her lines and paint, all working together to form a textured story—not dissimilar from her own life experience. As the first of her Taiwanese family to be born in the United States, Tracie grew up with the complexities of both cultures which has shaped her paintings in significant ways. In her practice, a style has emerged that channels aspects of Chinese brush painting, abstraction, and architectural renderings. Tracie's paintings recall beauty and wonder in the everyday, questioning the relationship between the seen and the unseen. Tracie attended the University of Texas in Austin and graduated with a degree in architecture. After several years of architectural work, her desire to shape environments shifted to the visual arts. Tracie has paintings in private collections all over the world, and has shown her work in galleries in Los Angeles, Vancouver, and Shanghai. 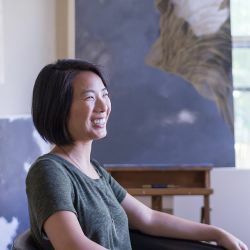 Tracie has worked with Restoration Hardware, Saatchi Art, and Nava Contemporary, among other galleries and art consultants, and created a collection of paintings for Marina Bay Sands in Singapore in 2016. Tracie feels fortunate to be pursuing art, and navigating work and life alongside her husband, sculptor Eóin Burke, and their son Alden.